The Alumni Club was first established in year 2001 with the first Alumni meet. The efforts to increase the registrations for club were revived from year to year. Currently we have more than 161 registered members of Alumni Club. Many more activities have been planned to further strengthen our Alumni relations in the coming years including social, academic and cultural activities. 1. To strengthen ties between the university and alumni and encourage them to participate in the various events such as alumni meet, workshops, seminars, etc. 2. To encourage alumni and prospective graduates to participate in the self-development and professional development programs set up by the Alumni Affair and other departments. Alumni are graduated students of SUC. SSD organizes a yearly meet to help strengthen their ties and improve their network. 1. Alumni Club: The Alumni Club was first established in year 2001 with the first Alumni meet. Currently we have more than 300 registered members of Alumni Club. 2. Alumni requests: Alumni can send their requests to SSD for any documentation; letters, transcripts etc. and the same would coordinate with the respective department/s to address the request. 3. Placement Assistance: SSD keeps the alumni informed of the upcoming job opportunities and takes measures to increase their placement chances. SSD or SUC does not guarantee job placements. 4. Continuing Education: SSD sends regular information to alumni regarding various types of courses running in the college in order to keep the learning process alive. 5. SUC events: Alumni are kept up-to-date about various SUC events to attend/participate. Our Alumni are a very important media to help us in enhancing our public image, creating trust in the market, improving our program structures with the help of industry inputs, placement assistance for current graduates and a lot more. University College has a clear policy and plan for continuously improving our Alumni relations. 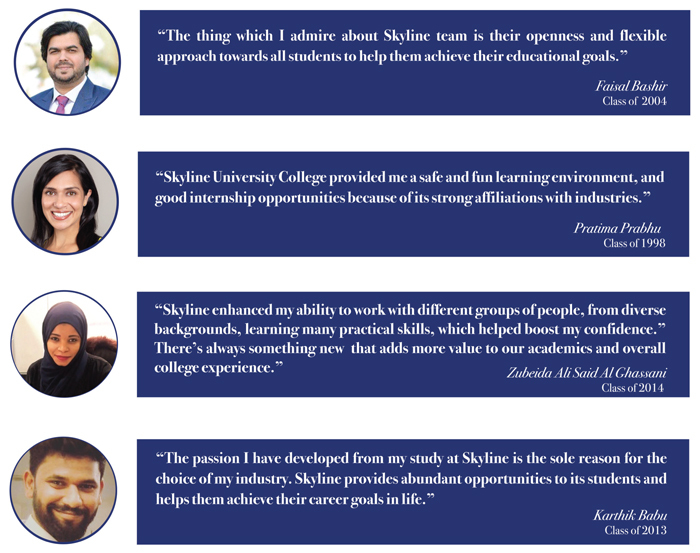 Skyline University College being one of the oldest institutions in UAE has a large number of graduated students and these graduates can become goodwill emissaries of the University College. SSD makes persistent and coordinated efforts to improve our Alumni relations. The Office of the Administration in the university provides a range of services to alumni, including providing transcripts, verification of enrollment/degree, and readmission to the University continuing education or additional degree pursuit. The Alumni Council may prescribe nominal membership fee for the events / workshops / training etc. The alumni association will prescribe any conditions of membership which may apply. Upon graduation, graduate will automatically be awarded membership free of charge. 5. The Alumni committee may appoint volunteer positions to assist the council members with the operation of Alumni Association. 6. The office of the Alumni Council shall be located on the University College campus; the office of the Alumni Council shall be supervised by the Committee members. Council shall visit the campus office once in a month. 7. Registration of Alumni members shall be done online by filling up the alumni registration form. 8. Only registered members shall get the benefits of alumni association. 9. Alumni should check the events in SSD calendar on the website. Over 140 computers are available in 3 computer laboratories with different configurations to match the requirements of the curriculum. Assisted by a lab officer, students are free to use this facility with prior appointment. All the computers have Internet accessibility. Skyline University College has 30 classrooms that are equipped with state of the art audio visual equipment provided with Internet connections. Classrooms are available for group viewing and individual viewing by using DVD/CD ROM based interactive CDs and Video cassettes. All faculty members use these facilities consisting of ultra-short thru LCD projector and computer for use as an instructional aid. The computers can be connected to the Internet for additional resources. The College has three heavy-duty photocopiers and printers for students to take photocopies and print their assignments. However, extensive care is taken to protect the copyrights of publishers. The Computer labs are available for access from 0930hrs to 1330 hrs and 1700 hrs to 2200hrs on working days. The lab access is available from 0900 hrs to 1900 hrs on every Friday and Saturday. Members must comply with the policies of the University College while using the learning support resources. The use of mobile phones, smoking, eating, and drinking are strictly prohibited in Learning Support Centers. Deliberate damage to, or loss of, materials, equipment or furniture is a breach of these regulations. Under such circumstances the member may be required to pay for any damage to the College, for any loss it may have suffered, or costs incurred directly or indirectly from the user's behavior. The University College accepts no responsibility for personal property lost or damaged on University College premises, including in the Learning Support Centers. The Sports department provides a well-equipped gym which can be used by its Students, Staff and faculty. Students have to ensure they register their names with the Sports Department before they can use the well-equipped Gym facilities. Students can use this facility between 11.00 A.M. to 7 P.M from Sunday to Thursday wherein the days allocated to boys are Sunday, Tuesday and Thursday and for girls it is on Monday and Wednesday. Boys and girls are not allowed to use the gym simultaneously. The Sports department provides facilities for various games such as Table Tennis, Badminton, Chess, Carom etc. in the multipurpose hall which can be utilized by the students between 1100 to 1900 Hrs. during their break time and afternoon. The Sports Department provides a recreation hall in the University College where Pool Table and Football Table are kept for students. SUC's alumni can make contributions to the university that supports our task of determining and disseminating knowledge. Parent Engagement is very important to student accomplishment and individual achievement. Henderson and Berla(1994) reviewed and analyzed eighty-five studies that documented the comprehensive benefits of parent involvement in children's education. This and other studies show that parent involvement activities that are effectively planned and well implemented result in substantial benefits to children, parents, educators, and the school. Above mentioned three simple steps require dedication and commitment from all students, parents, and university personnel. The resulting benefit of this investment in time and effort is well worth the future aspirations and success of every student. Excerpt from Home-School Relations: Working Successfully with Parents and Families, by G. Olsen, M.L. Fuller, 2008 edition, p. 129-130.